1991 Sports Illustrated Minnesota Twins World Series Champions NO LABEL! All Sports Illustrateds are in very good to excellent condition unless noted. Please check picture of Cover carefully. I have priced most issues accordingly but do miss a few flaws. Have thousands that aren’t listed so if you have a favorite player or team, let me know I probably have some with them on the covers. As always, free shipping! Buy from a trusted seller with flawless feedback and fast shipping. My feedback speaks for itself. Comes from a smoke free/pet free home. Please check all pictures and ask any questions before purchasing as there are no returns. Make sure to check out my other items for sale and to follow me as a seller as I am adding new items daily. Any questions or other photos needed please don't hesitate to ask. Thanks for checking out my page! 1965 World Series program Los Angeles Dodgers vs Minnesota Twins unscored. Nice program as pictured. Carefully Shipped with USPS First Class Package. SPORTS ILLUSTRATED withNO LABEL Newsstand Copy. No Exceptions! MINNESOTA TWINS WORLD SERIES CHAMPION. SPORTS ILLUSTRATED NOVEMBER 4, 1991 . See the picture above. You are getting this sports illustrated listed. It is used and has been read but real good flashbacks. Overall good condition. Sold as is. I will point out big issues when I see them, but they are sold as is and used. 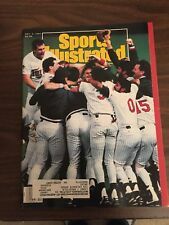 1991 Sports Illustrated (Minnesota Twins Celebration on cover). 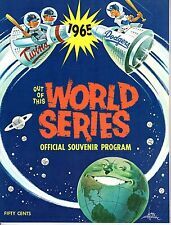 1965 World Series program, Los Angeles Dodgers @ Minnesota Twins, W/Game Ticket! All Sports Illustrateds are in good condition. Buy from a trusted seller with flawless feedback and fast shipping. My feedback speaks for itself. Comes from a smoke free/pet free home. Please check all pictures and ask any questions before purchasing. Make sure to check out my other items for sale and to follow me as a seller as I am adding new items daily. Any questions or other photos needed please don't hesitate to ask. Thanks for checking out my page! THE TWINS AND THE BRAVES TANGLE FOR THE TITLE. MINNESOTA TWINS. "TWINS PEAK". "TWINS CELEBRATE". SPORTS ILLUSTRATED's. WORLD SERIES. "THE WORLD SERIES". THE ISSUES IN THIS LOT ARE. Program is not scored. Koufax surrendered only four hits while striking out ten Twins.Jim Kaat took the loss for the Twins, allowing four runs (3 earned) on six hits in just 2 1/3 innings. Great Photos and ads.Item is in nrmt condition. Original Sports Illustrated Magazine. Date:November 4, 1991. Nice MINT Condition - Scorecard unused! MINNESOTA TWINS. WITH A COMPLETE RUNDOWN OF THE TWINS DRAMATIC. SPORTS ILLUSTRATED. NOVEMBER 4, 1991. "WORLD SERIES". A SERIES TO SAVOR. Super Rare No Label News-Stand Edition. A CLEAN "LABEL REMOVED" EDITION. The scan says it all for this special foldout cover of SI. The World Series is covered with a whopping 13 pages. The condition is very nice with normal wear and just a trace of wrinkling at the lower right corner, all pages and staples secure. This Sports Illustrated is in excellent condition. 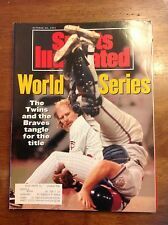 SPORTS ILLUSTRATED World Series Twins on cover (Nov. 4, 1991) collectable! Magazine is in nice shape with normal cover wear. An excellent addition to your Baseball Publications Magazine Collection. 1987 Sports Illustrated Dan Gladden World Series Twins. SPORTS ILLUSTRATED 1991 MINNESOTA TWINS WORLD SERIES. Shipped with USPS Parcel Select Ground. 5 Sports Illustrated 1987 Minnesota Twins World Series champs 87 & 91. All are in great shape. See pictures for details. Please ask if you have any questions. 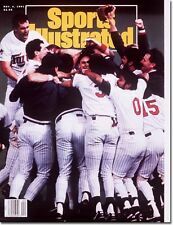 Sports Illustrated - November 4, 1991 - Minnesota Twins World Series Champions. 1991 World Series Minnesota MN Twins. Date: November 1991. Magazine: Sports Illustrated. Number: 20. Clemson Tigers. Twins World Series win from 1991. Has label but is in nrmt condition. MINNESOTA TWINS 1987 WORLD SERIES. November 2, 1987. SPORTS ILLUSTRATED®. No exceptions. 1987 VINTAGE October Sports Illustrated Minnesota Twins World Series! 5 out of 5 stars - 1987 VINTAGE October Sports Illustrated Minnesota Twins World Series! 1 product rating1 product ratings - 1987 VINTAGE October Sports Illustrated Minnesota Twins World Series! Oct. 21, 1991 issue of Sports Illustrated magazine in Gem Mint condition, featuring Kirby Puckett of the Twins on the cover. See scan for details. This is the October 28, 1991 issue of Sports Illustrated covering the Minnesota Twins - Atlanta Braves World Series. This is the November 4, 1991 issue of Sports Illustrated covering the Minnesota Twins defeat of the Atlanta Braves in the 1991 World Series.